But in truth, I’m super curious about this place, with its cobblestone alleys and eerie black houses. We pass a police car with a witch logo on the side. As a kid, I tried every tactic to get my dad to take me here, but he wouldn’t hear of it. He’d say that nothing good ever happens in Salem and the conversation would end. The story opens with the protagonist Sam’s dad in a coma. Sam and her step-mother Vivian have sold their New-York apartment to cover his rising medical bills and as such need to move back to Sam’s dads’ ancestral home in Salem. I found Sam (Samantha Mather) to be easy to connect with right from the start. But I found the character of Elijah the most compelling and ended up by far my favourite. There is an anti-bullying undercurrent to this whole story which I was completely on board with. The plot was interesting and well executed. The pacing was good. And there were light and dark moments balanced the whole way through. The only negative I found with the book, that dropped it from a five-star to a four-star read for me (so still an awesome book) was the romance. It felt forced at times and the story already had enough suspense and drama on its own. I just don’t think it was needed. Maybe the reason I couldn’t get on-board with the romance was because I didn’t connect with the Jaxon character? No, I think if they’d just been friends it would have worked fantastically! I did prefer the romance with Elijah, even though it was never going to work, and even if at times it didn’t sit right with me, at least the characters connection felt more built out. Meh, still an awesome book and one I’d happily read again. How I felt reading this book: intrigued, entertained, occasionally annoyed at some of the characters and angry at bully behaviour (but for the most part just the first two). I loved the mix of history and fiction and I loved how much the author put herself into the character*. 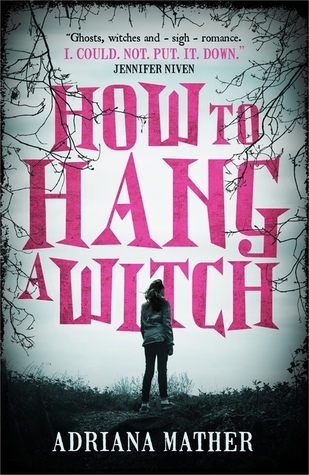 Who would enjoy this book: anyone with a fascination of Salem and the witch trials, anyone who likes young adult and paranormal fiction. *At the back of the book there is an author’s note where Adriana talks about her connection to the infamous Salem witch trials, which is fascinating, and which I read before starting the story. I think reading it first gave me some sense of who the author was, her strong connection to the story and some of her hopes for the message behind the book. I think it made for a more connected read – so if you are going to read this book, I suggest you read the author’s note first. Thanks Kelly. It was well worth the read, but yeah, the romance annoyed me for the most part with this one – And I love me some romance! BUT the Salem Witch Trials elements were fascinating and overall it was a really good read.